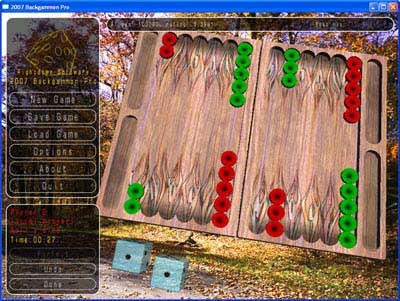 This backgammon game has realistic OpenGL-compatible 3D graphics - you can view the board from any angle. You can play against the computer or with your friends and there is an online system to play against thousands of players worldwide. It features neural networks based AI with 6 skill levels. Backgammon is the most ancient game of fortune and skill. The game's history began more than five thousand years ago. It is very popular in Near East..
...... The game's history began more than five thousand years ago. 2010 Backgammon is very popular in Near East and in Central Asia. The object of the game is to be the first player to remove all your pieces from the board by moving all your pieces to your home board and then bear them off. You move your pieces counter-clockwise to the bottom right quadrant of the board which is his home board. Your opponent moves pieces clockwise to the top right quadrant respectively. Qweas is providing links to 2010 Backgammon 5.02 as a courtesy, and makes no representations regarding 2010 Backgammon or any other applications or any information related thereto. Any questions, complaints or claims regarding this application 2010 Backgammon 5.02 must be directed to the appropriate software vendor. You may click the publisher link of 2010 Backgammon on the top of this page to get more details about the vendor.